Harry currently works with Titan Sports Management as an NHL Player Rep. Titan is a boutique style Hockey Management firm with notable clients such as Shea Weber, Oliver Ekman Larsson, Cody Eakin and Mikkel Boedker. Harry Mahood founded Northwestern Hockey Camp in 1987 delivering programs in Canada, The United States and Europe. Northwestern Hockey Camp Canada has hosted nearly 150,000 players who have built some game at NHSC, including NHL, Major Junior & NCAA stars; Jonathan Toews, Mike Richards and Joe Basaraba. Harry was the Assistant Coach of the expansion 2014-15 Bloomington Thunder USHL (29-24-7) owned and operated by Consolidated Sports Holdings, which also owns the Everett Silvertips WHL, Amarillo Bulls NAHL and N. Iowa Bulls NA3HL. Harry “Hoody” Mahood coached 2 seasons with the Amarillo Bulls. (2012-14) During his time with the Amarrilo Bulls Amarillo captured 2013 & 2014 NAHL South Division Championships, graduated 30 players to NCAA and won the 2013 National Championship. Mahood served as an Assistant and Associate Coach for the Topeka Roadrunners from 2009-2012. During his tenure with Topeka, the Roadrunners graduated 40 players to NCAA, won 2 NAHL South Division Titles, won the President’s Cup in 2011 and hosted the 2011 Robertson Cup. In 1999, Harry founded the Phoenix Polar Bears Tier 3 Junior A and served as President, General Manager and Head Coach for 10 seasons. During his tenure the Phoenix Polar Bears graduated over 170 players to NCAA, ACHA, Major Junior and Professional hockey. Harry won 7 WSHL League Championships and 9 Straight Appearances at USA Hockey Junior Nationals (2002-2010). The Polar Bears won the National Championship in 2003, National Silver Medal in 2002 and a National Bronze Medal in 2008. National Fair Play Award in 2004. Harry began his professional coaching career, in 1995, signing a 3 year contract to Coach in Division 1 Germany. Harry also coached the Ile Des Chenes Sr. AAA North Stars to a 1998 Canadian National Semi final at the Allan Cup in Truro, Nova Scotia. In 1999 Harry signed as Director of Amateur Hockey with the Phoenix Coyotes N.H.L. In his coaching career Harry has graduated over 200 players to NCAA, CIAU, Major Junior, USHL and Professional Hockey. Harry began his playing career in the BCHL at aged 15. Harry then played 4 seasons in the WHL, registering two 100 point seasons. In 1982 Harry signed as a free agent with the Calgary Flames. Harry also played 4 years of College hockey at the University of Manitoba C.I.A.U. winning two championships and setting a 4 year point’s record of 215 points. Harry finished his playing career in Division 1 Germany. Harry is a graduate of the University of Manitoba with a Bachelor of Recreation and Sports Management. In 1987 Harry founded Northwestern Hockey Camp Canada. Harry his wife Sarah have five children and currently live in Raleigh, NC. Sarah is Premium Customer Service Manager for Raleigh-Durham and Greensboro NC for American Airlines. Jamie is a graduate of the Fort Frances Minor Hockey program. Jamie was an accomplished Junior A hockey player having played in the SIJHL for the Dryden Ice Dogs and in the WSHL for the Phoenix Polar Bears. Jamie led the Phoenix Polar Bears to back to back WSHL League Thorne Cup Championships and two National Junior Championships. Jamie scored an incredible 125 goals in two seasons of play with the Phoenix Polar Bears and was a two time All Star. Jamie quickly transitioned from playing to coaching by leading the Fort Frances Bantam program for two seasons. A regional Bantam All Star Program 2012-13. In 2013-14, Jamie accpeted the Head Coaching Position with the Fort Frances Muskies Varisty High School Hockey Team. Jamie led his HS team to back to back (2013-14 & 2014-15) league and regional championships. The Muskies advanced to the All Ontario HS playdowns in 2014, 2015 & 2016. At the 2014 the All Ontario HS play down, Jamie led the Muskie's, to a birth in the quarter finals. It was the first time in 10 seasons, the Muskies' had advanced from the All Ontario pool play to the quarter finals. After three successful years of building the Muskie's HS program, Jamie led the program in 2016 to an All Ontario HS Hockey Championship. A remarkable accomplishment by a special group of players and coaches. Jamie is an advance certified coach through Hockey Canada and a well known and respected player development coach throughout NW Ontario. Northwestern Hockey Camp Canada is excited to announce Austin Sutter a Coach with the Amarillo Bulls of the NAHL will be lending his talents and experience to lead the Rio Rancho Camp June 19-23 at the McDermott Athletic Center. Austin has an extensive playing background starring in the BCHL before moving on to NCAA Division 1 Minnesota State University. After college Austin moved on to have a very successful Professional career in the CHL that saw him honored as the 2009 CHL Man of the Year. The award is presented annually to the Central Hockey League player adjudged to have best exemplified strong leadership qualities on and off the ice, while making significant and noteworthy humanitarian contributions to his community." Austin won a National Championship in 2013 as a member of the Amarillo Bulls Coaching Staff. Austin also serves as the Executive Director of the Amarillo Bulls Youth Hockey Association. Rocky Russo was announced as the fourth Head Coach in Amarillo Bulls history on Friday, June 16. Russo was an Assistant Coach for the Bulls under Head Coach Dennis Williams for three seasons amassing a record of 153-41-20, Winning 2 South Division Regular season titles, 3 division playoff titles and earned 3 consecutive trips to the Robertson Cup National Tournament. The Bulls also won back to back President’s cup championships as NAHL regular season championships, finishing with a 46-7-7 record in back to back seasons and setting the NAHL regular season record at the time with 99 points. 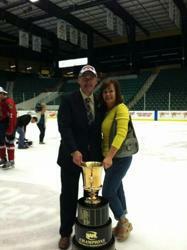 The Bulls culminated the 3 year run by winning the 2013 Robertson Cup National Championship. During the past four years, Russo was the Head Coach of the Philly Little Flyers of the Eastern Hockey League where the program was quite successful posting a mark of 159-34-14-3 and advancing to two consecutive league championships. The Little Flyers were back-to-back-to-back Regular Season Champions, and four time EHL South Division Champions. This past season the Little Flyers won a record 30 games in a row and had a 33 game point streak. Russo was selected twice as EHL Coach of the Year. Prior to joining the Bulls the first time, Russo was the assistant coach/director of scouting for the St. Louis Bandits in the NAHL. During his time in St. Louis, the Bandits won the South Division Playoff championship and advanced to the Robertson Cup National Tournament. Before heading to St. Louis, Russo was the assistant coach/video coordinator for the Mahoning Valley Phantoms in his hometown of Youngstown, OH. While in Youngstown the Phantoms qualified for 4 consecutive Robertson Cups, including appearances in the National Championship game in 2007 and 2008. He also served as the Head Coach/General Manager of the Youngstown State University Men’s hockey team. During his time with the Penguins the team won the 2006 CHA league championship. In 2007 Russo guided the team to a 18-14-4 record and entered the national rankings for the first time in the program’s history. The Penguins reached as high as #16 in the country that season, still the highest ranking the YSU men’s hockey program has achieved. In total Rocky has coached and recruited 119 student athletes. Rocky also Coach Brandon Saad, former Mahoning Valley Phantom, that went on to be the 43rd overall pick in the 2011 NHL Draft by the Chicago Blackhawks. Brandon was a member of the 2013 Stanley Cup Champions, and a finalist for the Calder Cup trophy as NHL Rookie of the Year. Rocky played his college hockey at Kent State University, where he graduated from in 2005 with a degree in Business Management. The Golden Flashes played in 3 National Tournaments during his time with the University. ©2019 Northwestern Hockey Canada Camps / SportsEngine. All Rights Reserved.